Research In No Motion: Who's Left to Buy RIM? Research In Motion could be up for sale, but with the usual names unlikely to make a bid for the entire company, where does RIM go? NEW YORK ( TheStreet) -- Research In Motion ( RIMM CEO Thorsten Heins wants to fix the beleaguered handset maker, but would not rule out a potential sale during the company's fourth-quarter conference call. The big question, though, is who would buy the struggling BlackBerry maker? The Waterloo, Ontario-based firm reported weaker-than-expected fourth-quarter numbers with Heins acknowledging that RIM needs "substantial change." 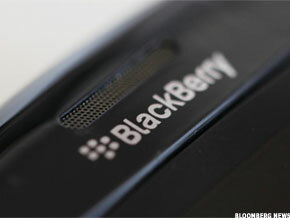 RIM posted non-GAAP earnings of 80 cents per share on $4.2 billion in revenue in its fiscal fourth quarter. The average estimate of analysts polled by Thomson Reuters was for a profit of 81 cents a share on revenue of $4.5 billion. Rumors of a sale of Research In Motion have increased in frequency since the beginning of the year. Names such as Samsung, HTC and even Amazon ( AMZN have been mentioned as potential suitors. In a research note to investors, Raymond James analyst Steven Li noted that Heins has not ruled out the possibility of a sale as part of the company's strategic review. The RIM CEO also mentioned leveraging the BlackBerry platform through partnerships, licensing opportunities, and strategic business model alternatives. Li lowered his price target to $15 following the earnings report, but said that the company could be worth $19 to $20 a share if a takeout happened. He rates shares "market perform." The problem with the takeout scenario, according to a hedge fund analyst, who declined to be named, is that there don't appear to be any publicly-traded companies eager to buy RIM. "I'm not sure there is an acquirer out there who has the strength/position to really enable them to right themselves," he said. "I think Microsoft ( MSFT - Get Report) made their bet, by partnering with Nokia ( NOK - Get Report) and it's too late for them - I think Nokia and Microsoft have put too much into their own system by now." Microsoft and Nokia previously looked at buying RIM, but decided to pass. RIM, of course, is seen as a source of national pride in Canada, employing 17,500 people, many of whom are located in the town of Waterloo. Watching the company lose market share to Apple ( AAPL - Get Report) and Google ( GOOG is clearly tough in a difficult economy, not only for shareholders, employees and management, but also for the Canadian government. Set against this backdrop, there is the possibility of the Canadian government stepping in and preventing a takeover from a foreign company, as it did with Potash ( POT and BHP Billiton ( RIMM, saying the deal was not in the country's national interest. With a market cap of $7.5 billion, though, RIM is still too large for private equity firms to have interest in, even for the Ontario Teachers Pension Plan (OTPP), which attempted to buy BCE ( BCE in 2007. The OTPP could prevent a takeover and keep RIM under Canadian control, but an exit plan is necessary. "Why would they RIMM want to be like a private equity play? I just don't think the cash flow supports that," said another hedge fund analyst, who declined to be named. The company is clearly hoping that its BlackBerry 10 platform can be its savior. Developers will get a first look at the technoloy in May, but there are concerns that this could still be too late. "We believe that RIMM has a lot riding on a successful BlackBerry 10 launch," explained Wedbush analyst Scott Sutherland, in a research note. Sutherland rates Research In Motion shares "neutral" and lowered his price target to $13.50 from $14.50. Taking the company out of the public spotlight and making sure they execute correctly with BlackBerry 10 could be the best course of action for RIM. The question remains: who's left to buy the company? Shares of Research In Motion are higher Friday, up 5.9% to $14.54.